2009 looks set to be a break-through year for Twitter. 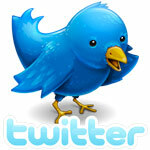 This article will show that interest in Twitter is skyrocketing outside the US, and also where this is happening. To be able to examine the worldwide buzz about Twitter (the general interest level per country, if you like) we have looked at Google search data for searches made so far in 2009. This gave us a fresh perspective on the current trends. Note that Google Insights for Search, the tool we used, normalizes the data. This means that the numbers are adjusted relative to the size of the countries (or the number of overall searches made in that country). If Google didn’t adjust its data this way, the list would always be dominated by the countries with the largest number of Internet users. The top five results are all English-speaking countries. In fact, seven of the top ten countries most interested in Twitter have an English-speaking population. 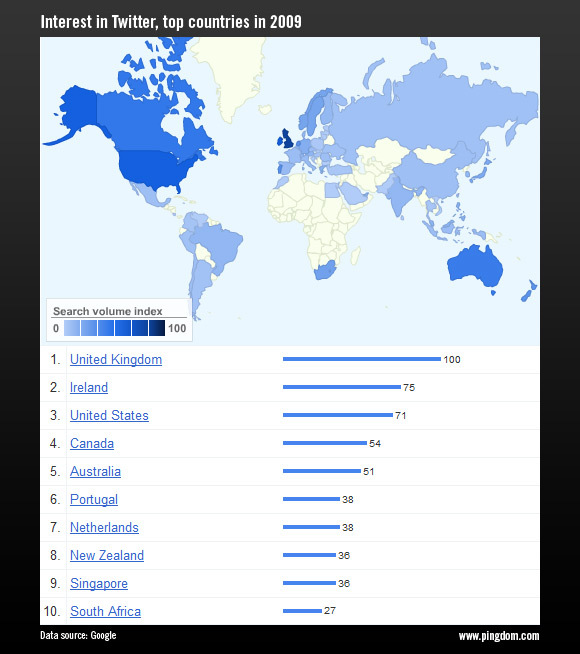 The UK and Ireland are displaying the highest interest in Twitter at the moment. The US is not in first place, as it was in 2008. Although if we just looked at absolute numbers (search numbers not adjusted by country size), the US would probably still be in first place since it has its strongest base there (not to mention it’s a huge country). What these results show us is that Twitter is gaining a lot of buzz outside the US, but predominantly in English-speaking countries (at least right now, the beginning of 2009). The dominance of English-speaking countries could be a side effect of the simple fact that the majority of Twitter’s existing user base speaks English, which makes it easier for new English-speaking users to leverage the Twitter community. Someone tweeting in Swedish or German is limited in the sense that a much smaller subset of users can follow them. The popularity of Twitter in the UK is a quite recent phenomenon. Look at the below graph, showing the UK search volume for Twitter over time. 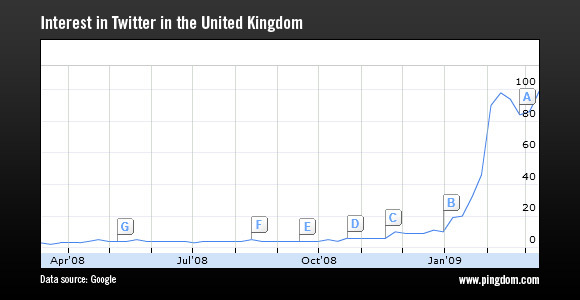 It clearly shows that interest in Twitter in the UK has skyrocketed in 2009. Twitter’s recent success in the UK has been documented elsewhere as well. The traffic-trackers at Hitwise reported in January that UK traffic to Twitter’s website had increased 10-fold compared to early 2008. Some notable British Twitter users are Stephen Fry (294k followers) and John Cleese (100k followers). Further evidence of Twitter’s spreading influence outside the US is that here in Sweden (Pingdom’s HQ is in Sweden) we’ve started seeing Twitter mentioned in the press quite often, but only very recently. Just six months ago you heard almost nothing about Twitter in Swedish media. Twitter’s growth in the US is still strong, but it would seem that the worldwide level of interest in Twitter is high enough to ensure that much of its growth in 2009 will be powered by other countries. Judging by how the year has started, 2009 looks set to be a remarkable year for Twitter. In the UK the MASSIVE growth was kickstarted by Stephen Fry mentioning his Tweeting on a major TV Chatshow (which had generated much UK interest because it was the host’s return from suspension by the BBC). As an irregular user of Twitter, I saw my own follower’s dramatically increase in the aftermath of that. In my own sphere, in the Church Life, we saw an unprecedented use of many forms of social media, but especially Twitter during the recent General Synod. What was once semi-closed meetings are now fully and widely participative with debates openly live-blogged even by delegates themselves. This dramatically changes our relationship to such events (for the good). @Fr. Simon: Thanks for sharing that bit about Stephen Fry. Very interesting. I remember it wasn’t long ago it was announced that he reached 100k followers, and now, just a few months later, those numbers have swelled to close to 300k. Pretty amazing. And it must be great for Twitter to have their service endorsed publicly like that. Twitter is next target of Google. Woohoo! 100 followers on Twitter!